Elena Martinez has hidden her eidetic memory all her life--or so she thinks. When powerful tech giant Aether Corporation selects her for a top-secret project, she can't say no. All she has to do is participate in a trip to the future to bring back data, and she'll be set for life.Elena joins a team of four other teens with special skills, including Adam, a science prodigy with his own reason for being there. But when the time travelers arrive in the future, something goes wrong and they break the only rule they were given: do not look into their own fates.Now they have twenty-four hours to get back to the present and find a way to stop a seemingly inevitable future from unfolding. With time running out and deadly secrets uncovered, Elena must use her eidetic memory, street smarts, and a growing trust in Adam to save her new friends and herself. I had the chance to meet Elizabeth Briggs at ALA Midwinter and let me tell you that she is so sweet. I have not had the chance to read any of her works before this one and let me tell you that I am now inclined to check out her other works. This is her first young adult novel and I thought she did it justice. The novel follows Elena Martinez and four other teens as they are recruited for a mission to go into the future to observe and bring back information. However, when going into the future they realize there is much more information that was kept hidden and after breaking the rule of looking into their fates, Elena and her teens must find a way to solve the mystery and they only have 24 hours to do so. Elena has the ability to remember details to the exact measure and there are not enough reasons why I wish I could have this ability…especially being in grad school and everything. She is a female heroine who has gone through stuff that allows her to push through tough situations. However, I felt that every character had some sort of issue they had to resolve and being in the future only motivated them to work towards a better future. Every teen had a secret and the fact that they were all dealing with their issues in their own way made them feel more realistic. There was some romance in the book and the fact that it was not overpowering was a relief for me. I just have this feeling that there has to be all this excessive romance in books and it has to be rushed but the idea of some settle is something to be appreciated as well. The idea of time travel was interesting in this novel and I have read only a handful of books on the idea of time travel and it was decent in the sense that for someone who is not educated in the more specific aspects of science there was not much terminology that had me stopping to think about it which was a bonus for me. Overall this was a good read that I recommend to those looking for a science fiction read that will keep you hooked till the end. 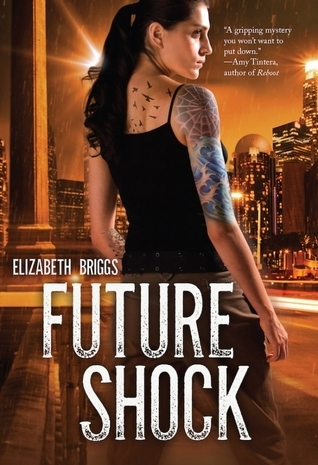 I hope Elizabeth decides to write another book for the young adult audience because I will want to check it out.